Don’t call user names in your post! Try to export your project. Re-import the project into the builder. Try to export your apk again. Just try what I wrote. I can approve your app every time again. @Diego Do you have time to help here? Maybe @developer_calife can send you his project that you can check the aia file for missing things? Can you please send me the AIA? I have sent you the aia file in message thanks for your time. I think he is busy give him sometime. Be patience! @Mika Dear Sir, issue is still not solved please help me. I again requested for approval but app still says your app is not approved. 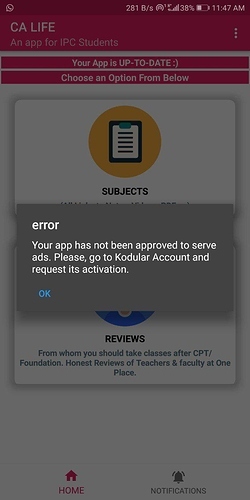 App is showing ads in live test, but despite being approved a couple of days ago it is showing error that APP IS NOT APPROVED ?